Clearwater Character Beth Warmath " They call me the ‘Muralista,'" said Beth Warmath, a Clearwater resident, of one of her nicknames given to her by local designers. 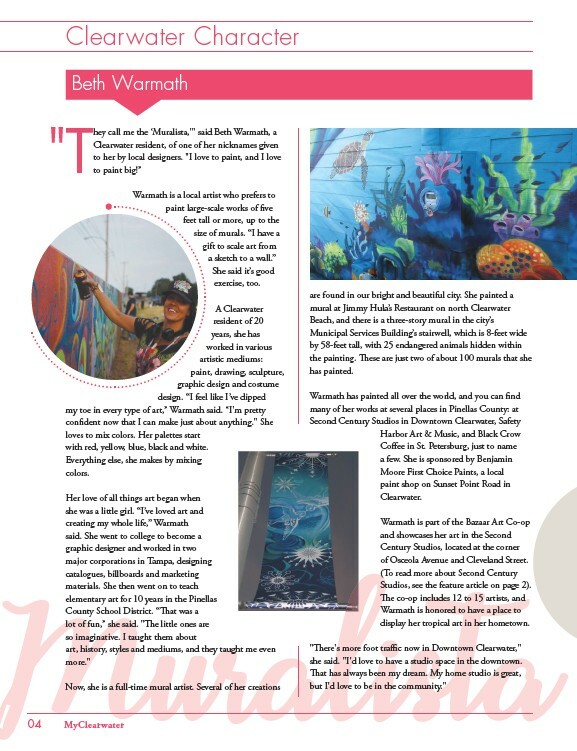 "I love to paint, and I love to paint big!” 04 MyClearwater Warmath is a local artist who prefers to paint large-scale works of five feet tall or more, up to the size of murals. “I have a gift to scale art from a sketch to a wall.” She said it’s good exercise, too. A Clearwater resident of 20 years, she has worked in various artistic mediums: paint, drawing, sculpture, graphic design and costume design. “I feel like I’ve dipped my toe in every type of art,” Warmath said. “I'm pretty confident now that I can make just about anything." She loves to mix colors. Her palettes start with red, yellow, blue, black and white. Everything else, she makes by mixing colors. Her love of all things art began when she was a little girl. “I’ve loved art and creating my whole life,” Warmath said. She went to college to become a graphic designer and worked in two major corporations in Tampa, designing catalogues, billboards and marketing materials. She then went on to teach elementary art for 10 years in the Pinellas County School District. “That was a lot of fun,” she said. "The little ones are so imaginative. I taught them about art, history, styles and mediums, and they taught me even more." Now, she is a full-time mural artist. Several of her creations are found in our bright and beautiful city. She painted a mural at Jimmy Hula’s Restaurant on north Clearwater Beach, and there is a three-story mural in the city’s Municipal Services Building’s stairwell, which is 8-feet wide by 58-feet tall, with 25 endangered animals hidden within the painting. These are just two of about 100 murals that she has painted. Warmath has painted all over the world, and you can find many of her works at several places in Pinellas County: at Second Century Studios in Downtown Clearwater, Safety Harbor Art & Music, and Black Crow Coffee in St. Petersburg, just to name a few. She is sponsored by Benjamin Moore First Choice Paints, a local paint shop on Sunset Point Road in Clearwater. Warmath is part of the Bazaar Art Co-op and showcases her art in the Second Century Studios, located at the corner of Osceola Avenue and Cleveland Street. (To read more about Second Century Studios, see the feature article on page 2). The co-op includes 12 to 15 artists, and Warmath is honored to have a place to display her tropical art in her hometown. "There's more foot traffic now in Downtown Clearwater," she said. "I'd love to have a studio space in the downtown. That has always been my dream. My home studio is great, but I'd love to be in the community."